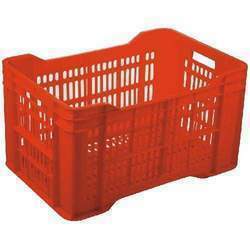 The different types of Plastic Crates we manufacture are supplied to numerous retail outlets, super markets etc., for storage & display of fruits & vegetables. The showcased plastic crates has flat bottom and is available in 42 liters capacity. This crates is used for bulk storage of products. The plastic used in making is 100% virgin and the crates are corrosion resistant and very durable. They can be nested together, when not in use and stored easily.